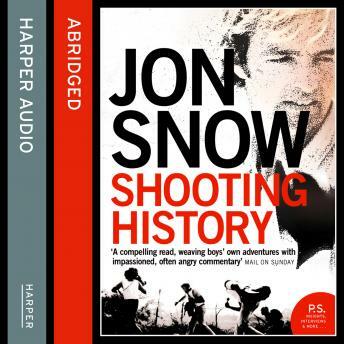 Jon Snow is perhaps the most highly regarded newsman of our time; his qualities as a journalist and as a human being - his passion, warmth, intelligence, frankness and humour - are widely recognised and evident for all to see most nights on television [Channel 4 News] and now by his own voice in the pages of his first book. His vivid personal chronicle is filled with anecdotes and pithy observations, and delightfully records his life and times since becoming a journalist in the early 1970s. He reported widely on Cold War conflicts in Iran, Iraq, Afghanistan, Eritrea, Ethiopia, Angola and Central America before becoming a resident correspondent in Washington D.C. in the 1980s, and has met and interviewed most of the world's leaders. Drawing lessons from these experiences, he has sharp things to say about how the increasing world disorder came about following the fall of the Berlin Wall; how the West's constant search for an enemy has helped unhinge the world; and how and why the media have, in general, been less than helpful in drawing attention to key political and global developments.